This crostini is great for cocktail parties or a quick snack. It takes just a few minutes to put together so it’s a great option if you have a few people over and only have a little prep time. You can use any fresh herbs you like, whatever you have around will work. I used truffle honey but any honey will do. Use a good quality hand dipped ricotta for this, it will really make a difference. Serve with a nice glass of bubbly and enjoy! 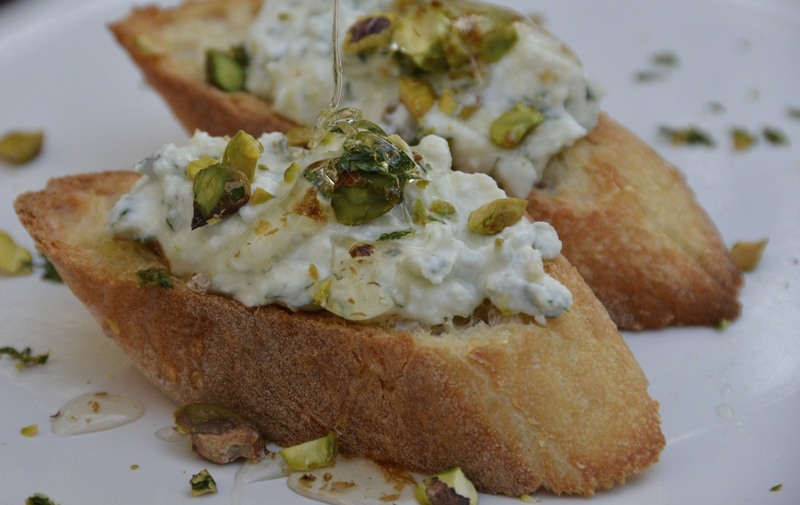 Mix ricotta with lemon juice, zest, herbs, pistachios and season with salt. Cut baguette in slices and drizzle with olive oil. Toast baguette slices until crisp. Top with ricotta mixture and drizzle with honey. Garnish with chopped pistachios and herbs if you like. This looks delicious, I will definitely make it for my next cocktail party! Ooh, this looks gorgeous! I adore pistachios. I found your blog through the Freshly Pressed section, and I’m following it now for the recipes and the photographs! 🙂 This is gorgeous.